Staying active and exercising can be harder as you age. If you are having a hard time getting the perfect exercise routine, think about water aerobics. Water exercising can get your heart rate up but is easier on your bones and joints. Try several senior water exercises and reap the benefits. What are Water Exercises for Senior Citizens? Most water exercises are similar to activities that people perform when they workout on land. There are different types of physical activities that make up water exercise programs ranging from general aquatic exercise classes to water aerobics. It is just as important when exercising in the water as it is when exercising on land to warm up your muscles by doing a series of stretching exercises before beginning your water exercise program. The exercise program should also end with a set of cool-down exercises. 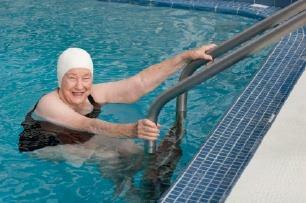 Exercising in water eliminates much of the joint and muscle pain many seniors feel when they exercise. When a person is in the water, there is less strain placed on his or her body, and the water buoyancy helps to support weight. The water also reduces the impact that movements have on bones and joints. The water also provides more resistance than the air does during land exercises. In general, water exercise programs provide the same health benefits, in less time, than exercise programs done out of the water. Seniors experience many health benefits associated with water exercise. According to the Arthritis Foundation, water exercises are very beneficial for many seniors with arthritis and related conditions. Throughout the country, the Arthritis Foundation Aquatic Program is conducted at many pools. To find out if there is a program in your area, contact your local chapter of the Arthritis Foundation. An office directory of the local chapters is provided on the foundation's website. Before starting any type of exercise program it is always best to check with your doctor to discuss the program and if it is safe for your medical condition. If you are using a backyard pool, hot tub or spa for your water exercises, make sure there is someone nearby in case you need assistance getting in or out of the water or during your exercise program. If you have arthritis or other joint problems, the optimum temperature of pool water is between 85 - 90 degrees Fahrenheit. Make sure to drink plenty of fluids. It is possible to become dehydrated even though you are in water. - --Taking part in senior water exercises is an excellent way to improve your overall health, relax and have fun.